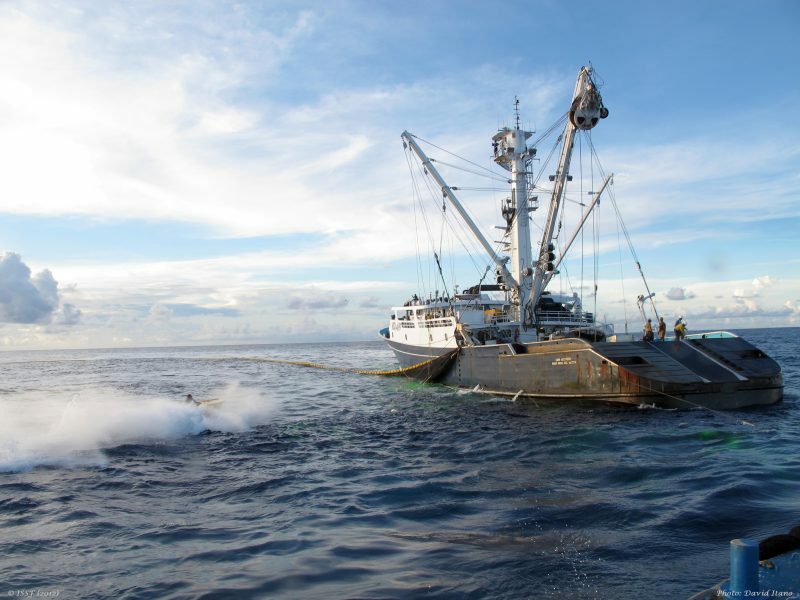 The Western and Central Pacific Fisheries Commission (WCPFC) is in an enviable position. All WCPFC tuna stocks — except for Pacific Bluefin tuna — are at healthy levels. That is, the ISSF Status of the Stocks report rates these stocks as “green,” which means they are not overfished nor subject to overfishing. Prior management actions taken by WCPFC and its member nations — as well as by the Pacific Islands Fisheries Forum Agency (FFA) and the Parties to the Nauru Agreement (PNA) coastal states for their national waters — have created this positive picture. But further improvements are needed to ensure the long-term sustainability of western and central Pacific Ocean (WCPO) resources region-wide and to combat illegal, unreported, and unregulated (IUU) fishing activities that threaten them. Strengthen management of at-sea transshipment for longline vessels to reduce the likelihood of IUU fishing activities, labour abuses, and other illicit activities, and to address ongoing non-compliance consistently identified in the WCPFC Technical and Compliance Committee (TCC). FADs are man-made floating objects specifically designed to attract and aggregate fish. FADs are widely used as a fishing gear due to the efficiency advantage they provide, but they can be associated with several negative ecosystem impacts, such as higher bycatch of some species and beaching (when a FAD that was previously drifting at sea washes ashore and becomes grounded or entangled on a reef). Additionally, FADs often incorporate old netting that entangles marine species like sharks and can result in “ghost fishing” (where fishing gear that is lost continues to function by catching fish or ensnaring other marine animals), and the use of plastic components in FADs contributes to ocean pollution and marine debris. It is evident that managers need greater understanding of this gear to improve measures that regulate its impact. ISSF, in collaboration with industry, researchers and governments, has undertaken significant research on FAD designs. This research shows that the use of non-entangling FAD designs by tuna vessels minimises the capture of bycatch species, including sharks and turtles. ISSF is also leading collaborative research on biodegradable FADs, to explore how to minimise the introduction of plastic into the marine environment via FADs and beaching. Although the WCPFC and WCPO coastal states have implemented FAD management measures, a mandatory requirement for the use of non-entangling FAD designs remains outstanding. We’re asking WCPFC delegates to adopt provisions that detail such a requirement, as recommended by the FAD Working Group, including a clear timeframe for the mandatory use of biodegradable FADs, as proposed by FFA Members and the European Union. And we are supporting requirements for FAD tracking and the development of protocols or policies for FAD recovery. Transshipment is the transfer of fish or fish products, at sea or in port, from one fishing vessel to either another fishing vessel or to a vessel used solely for the carriage of cargo, for further transport. At-sea transshipments are of special concern in fishery management since, if not properly monitored, they can complicate the collection of accurate data and the traceability of product, creating a fertile environment for IUU fishing activities. Although the WCPFC promotes in-port transshipment, at-sea transshipment is permissible if a member country states that it is “impractical” to conduct transshipment in port. There are currently 10 countries that permit their longline vessels to conduct at-sea transshipment. This exemption has resulted in an increasing number of longline vessels conducting at-sea transshipment in the WCPO — in effect, the exception is becoming the rule. WCPFC reports continue to show that specific member countries persist in their non-compliance with the current WCPFC measure on transshipment. Along with failing to provide observer reports to WCPFC, these members are also not providing advance notification of the intention to tranship, nor are they reporting transshipment events — all of which are basic requirements for managed transshipments at sea. Given this ongoing non-compliance by some WCPFC member countries — and the availability of electronic monitoring — we echo the strong support for the TCC recommendation. We urge the Commission to undertake a thorough review of its transshipment regulation in 2019 and adopt substantive improvements. As we prepare to travel to Hawaii for this year’s WCPFC annual session, we ask that you join our efforts to achieve sustainable management of Pacific tuna fisheries: Urge your country’s support in adopting strengthened management of FADs and at-sea transshipment activities. Claire van der Geest is Strategic Policy Advisor for ISSF and Bubba Cook is the Western and Central Pacific Ocean Tuna Programme Manager at World Wide Fund for Nature.